To bench or not to bench? That is the question as Mauricio Pochettino decides where to fit hat trick hero Lucas Moura in Tottenham�s back to back challenges against Quadruple-chasing Manchester City. Does he use him at the start of Wednesday�s second leg Champions� League quarter-final, raiding alongside the irrepressible Son Heung-min? Or should he call him as an explosive substitute if City wipe out the vital one goal lead that Spurs take to the Eithad? I have a hunch (could be something to do with the way I�ve always stooped over my keyboard) that Professor Poch will go for the jugular and select him from the kick-off to try to frighten the life out of City with an away goal. We could all see by the heart-warming way Lucas celebrated with his baby son, Miguel, after his three glorious goals against Huddersfield that he is in a great place. Pochettino will want to cash in on his super confidence. 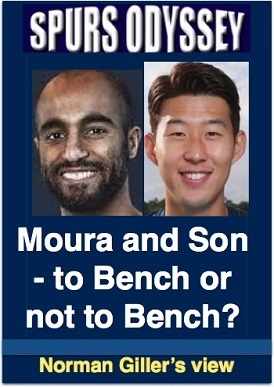 With Our Harry Kane sidelined, Moura and Son is a two-pronged attack that could frighten and foil Guardiola�s gladiators. Our Spurs Odyssey guru Paul H. Smith tells the story of Moura�s happy hour against Huddersfield here: Moura! Moura! Moura! Lucas quite rightly gets man of the match honours but it was still a close run thing with born-again Moussa Sissoko. I would love to thrust down the throats of some keyboard warriors the daft things they used to write about the formidable Frenchman, who plays with power, pace and passion. He and Victor Wanyama are intimidating together in midfield and that is another selection �problem� for Pochettino. Sissoko is guaranteed his place against City on Wednesday. But to bench or not to bench Wanyama? It�s a nice headache for the Poch to have. What was that critics were saying about there being no depth in the Tottenham squad? To bench or not to bench? Over to Generalissimo Pochettino. COYS!! Who is the Geordie who started and finished his playing career in Wales, netted 48 League goals for Spurs and against which team did he score two League Cup quarter-final goals? Please email your answer to me at SOQL35@normangillerbooks.com. Deadline: midnight this Friday. I will respond to all who take part. Last week I asked: Who won 61 international caps, played at Wembley in his Tottenham debut, and which club did he manage from 1994 to 1996? Yes, Ray Clemence, the goalkeeper who had his golden years at Anfield but still managed to make himself one of the old Lane Legends before managing at Barnet. He made his Tottenham debut in the Charity Shied match against Aston Villa at Wembley in 1981. One more question to go, friends, before the dreaded tie break to break the logjam at the top of the SOQL table. Please keep a check on your scores. I will be trusting you to count your points as I do not have faith in my email server. Thank you for taking part. See you back here same time, same place next week. Happy Easter. COYS!